A key component of the commercial and regulatory structure of the pharmaceutical industry is generic drug development and approval, which is managed by the Abbreviated New Drug Application (ANDA) process. There are complex legal and regulatory processes to navigate in launching generic drugs, and to be competitive it is important to have proper strategic and tactical guidance. ANDA Litigation provides this guidance in a manner appropriate for generic drug companies, branded drug companies, lawyers, and judges. A companion book, Pre-ANDA Litigation addresses generic drug portfolio management and branded drug patent strategies in anticipation of generic drug application filing. The best way to illustrate the impressive depth and breath of this book is by describing the authorship. Kenneth Dorsney is Editor-in-Chief, and is supported by eight associate editors — all from different law firms across the United States and Canada. The chapters are written by dozens of authors, from a diversity of law firms. The contributions of so many specialists explains how the book can cover topics ranging from the drug approval process through the minutiae of litigation trial management with sufficient detail, and with deep strategic and tactical guidance, to appeal to a broad audience. The foreword, written by a federal judge, sets the stage — litigation related to generic drugs can be a difficult topic for lawyers and judges alike. Drug patent litigation may challenge judges, who often have limited knowledge of the underlying scientific and regulatory principles, and who also are unaccustomed to the special legal and case-timing implications introduced by special ways in which the Food and Drug Administration regulatory structure integrates drug patents. Litigation often also involves specialist attorneys operating in cooperation with local counsel. While the specialist counsel may have great experience with pharmaceutical law, local counsel is vital for their knowledge of state laws and the nuances of each local courts and judges. 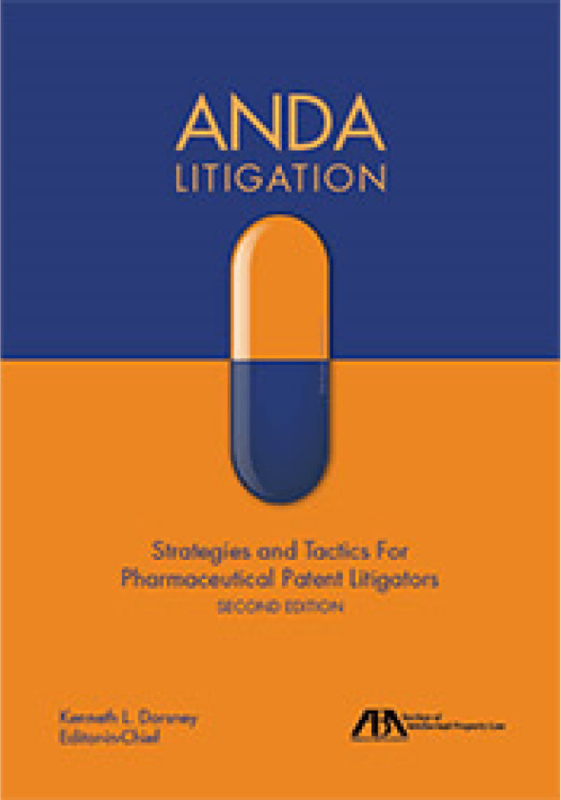 ANDA Litigation is a vital resource to help judges and local counsel better understand the case law, tactics, and larger strategies involved in drug patent litigation. The chapters cover an impressive scope. The book starts with an overview of the regulatory structure of the pharmaceutical industry, of drug development, and of filing for generic drug approval. Important details are provided on timelines of regulatory filings as well as how both branded and generic firms should communicate with each other and with the Food and Drug Administration. With the overall strategy established, subsequent chapters delve into the details of litigation, and extend into tactical guidance on how patent listings and the Orange Book can be used (or should not be used) as levers. There are extensive annotated references to relevant cases to help interested readers seeking deeper resources. Given the stakes of litigation — both in terms of the economic value of prevailing in obtaining (or blocking) generic entry as well as the substantial legal fees involved in litigation — the guidance in these chapters should readily recoup price of the book. Settlements are common in all forms of litigation, and they have been under increasing scrutiny from antitrust regulators. There is a substantial and detailed discussion of what remedies are available to each party, what types of settlements are common, and also how to avoid falling afoul of antitrust laws. As mentioned above, pharmaceutical litigation often involves many parties with knowledge limited to just a few of the facets — local counsel may be adept at litigation but unfamiliar with the peculiarities of how drug cases work, and expert witnesses may be very knowledgeable of the industry but unfamiliar with trials. The closing chapters of the book provide very detailed guidance on topics such as pretrial preparation, trial management, and general management of litigation. The final chapter provides an important endcap. By definitiion, ANDA litigation is most relevant to the United States as the ANDA is a construct of the United States Food and Drug Administration. But, what of generic drug entry in other countries? The last chapter addresses generic entry in mature major markets around the world: Australia, Brazil, Canada, the European Union and United Kingdom, and Japan. Finally, the appendices provide important examples of legal forms which complement the text very well. For example, the book explains how generic firms are required to provide an ‘Offer of Confidential Access’ along with patent non-infringement statements. Failure to provide sufficient confidential access can leave them an a legally disadvantaged state, and offering too-broad confidential access can have negative competitive consequences. So, how should a generic firm structure an Offer of Confidential Access? There’s an example in the first appendix. In all, there are fifty appendices spanning more than 200 pages — the appendices are longer than many books! In summary, ANDA Litigation is a vital resource for parties involved in protecting branded drugs or in generic drug launch. The price, which is relatively low for a book of this size and scope, should be recouped quickly by avoiding costly strategic and tactical missteps, and in savings on legal expenses.